Translations: Ganbare Goemon Gaiden: Kieta Ougon Kiseru patch is out! 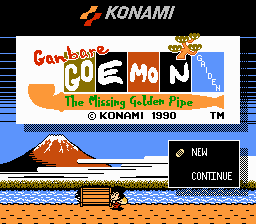 "Ganbare Goemon Gaiden: The Missing Golden Pipe" (gaiden meaning tale/side story/legend) is the first GGG RPG for the Famicom. It's well-known for being the first turn-based RPG in the series, for introducing certain recurring characters, and for being even more wacky than the earlier games in the series. Now, thanks to Mr Fwibbles of Adventurous Translation the game can be enjoyed in English. So, without further ado, have fun! Re: Translations: Ganbare Goemon Gaiden: Kieta Ougon Kiseru patch is out! YEEESSSS!!!! As soon as I finish Tales of the Abyss I'm going to sink my teeth into this cute little thing, hehe. Thank you very much for your hard work in making this game playable in English. By the way, you said in the GG Gaiden development thread that you weren't interested in translating Gaiden 2 because you don't like it at all. Is it really that bad?  Excellent work! Thanks for bringing the world more Goemon. Discussion about the ending credits, with Mr Fwibbles. 1) Original game has a bug showing them incorrectly. Mapper chr write issue. Fix here. 2) rom 7f000 + 10 header has specialized font. It's stored as annoying interleaved 1-bpp tiles. 2 colors = two different alphabets. 3) Bigger irritant is they are drawn as two 8x16 sprite tiles. Reusable kanji and such. To get the replacement text to fit, 8x8 English font has to be used. There's a decent # of 8x16 tiles to play around with though. If there's someone worthy of finishing this off, please send a PM directly to Mr. Fwibbles. Only serious intent please and maybe -after- you've demonstrated that you've inserted your own replacement alphabet and overcome the technical challenge. Thanks for this! I was wondering what "messed up by default" meant on the project page. Congrats on completing this project! I've heard about the ending being broken before. I assumed Konami made so many VRC variations that even they got them mixed up. 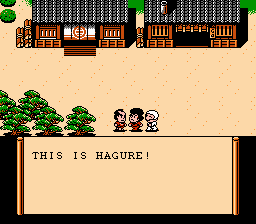 This is a cool translation, I only wish that Goemon and Ebisumaru would run while holding down the B button. Tome of retro gaming knowledge! Just a reminder that rainponcho (see above) has graciously released a fix hack to enable the credits in this game to be displayed properly but the text are in Japanese. So either the translation project's leader or somebody else, as he said, can try to translate and insert the English text instead. Lists of reliable databases and review sites for retro games. Mr. Fwibbles tried to insert but ran into the sprite text problem (reused kanji). I didn't want to do it either because .. it's hacking work. I'm sure someone will do it. Or maybe Mr. Fwibbles can add the translated names to the readme, or post them here. Admittedly I didn't feel like uploading the bug fix patch - kinda small. He thought it would be a good idea for native Japanese gamers also. Which is true. I'm doing enough original game bugfixes for hack revamps or Japan ==> English translations lately. Or a couple microphone controller hacks (like Ganbare Goemon 2 nes). Maybe I should just start uploading everything sometime. Clear my drive of notes. edit: Which reminds me. Mr. Fwibbles pointed out that there's some (original?) bugs that may happen if you have no money. Like seeing a show at the port. Might be other hidden gremlins lurking around. Don't know how they did it, I suppose it's just a matter of taking screenshots and using photoshop to change the text, etc. There's also the ending, translated into english as well, for GG Gaiden II. I have watched neither of them, don't want to spoil myself yet. When I complete GG Gaiden I, if there's no fix yet, I'll watch the ending there. Ah, would you want me to add that list of bugs note as a link in the Game Description sector of the relevant game here? Not sure if the moderators would allow that but it can be tried. I hope that someone can add that to the TCRF page. Well, I think that translated ending credits roll page could be very useful to add on as a link to the credits fix hack page, what do you think, rainponcho? EDIT: Well, it appears that TCRF has a rule stating that no information on glitches should be added there. What a bummer. Well, I'm just going to copy the notes in the spoiler body below here so that it doesn't get lost forever. At least you can click on the 'News Articles for this Translation' text under the Links sector in the patch page above and then go to the bracketed comments text at the bottom-right corner of the front-page news for it which leads to this thread. And then see these notes. By playing around with the options after selling your last item in a shop, you'll sometimes discover an invisible third option. Selecting it does nothing. It's pretty harmless. There's a boss fight where Yae can sometimes target an invisible enemy too, but the game thinks the enemy is dead. You can also see this in action by selecting a Jutsu that's low on the list and trying to use it while that character's Jutsu is sealed. If you try to see the "show" at the first port, but don't have enough money, the NPC will ask you if you enjoyed the show (despite never seeing it), then the screen will flash a few times. After this, the palette will be screwed up, and this even extends to the world map. I think it does change back eventually, but it's probably best not to mess around with this one too much. In some parts of the game (it happened to me in Bear's Castle, but I saw it happen somewhere else in a gameplay video), the borders that are supposed to be off-screen can close in for some reason, and two thirds of the screen will be messed up. This glitch is pretty annoying in dungeons, as it can make it hard to figure out what you're looking at, but you can fix it by using a Mirror item (or Koban's Exit Jutsu) and resting at a nearby inn or food shop. In one of the last dungeons in the game, in the room where you find the "Pout Mask" key item, a softlock can occur if you walk up and down the left side of a small wall in that room until a battle is initiated. After the battle, all buttons will stop responding. This is related to the scroll depth glitch. The credits sequence, while short, doesn't display correctly. Again, the original game does this too. Someone did fix it once, but apparently it just broke the title screen instead. If you fill your inventory, then use the Item command in a battle, 3 or 4 extra items will be listed: at least one "HOUSEPLA", and 2 others (which I presume depend on what else is in your inventory). While the other items do exist in the game, "HOUSEPLA" is the result of the game looking at the incorrect dictionary and also getting the length of the text wrong. "HOUSEPLA" can be used as an item (it does moderate damage), but it isn't supposed to exist and causes a bit of strange text. This happened to me in 2 places, most notably one of the tea houses. Depending on where you stand when talking to certain NPCs, some letters may appear to intermittently flash along with a junk tile from another tileset. Similarly, depending on where you stand when opening the menu in towns, some of the water tiles may temporarily turn into numbers as the menu comes up. ^ Makes sense to me. Anyone can edit the project page and add any additional reference links, information, cleanups, etc.